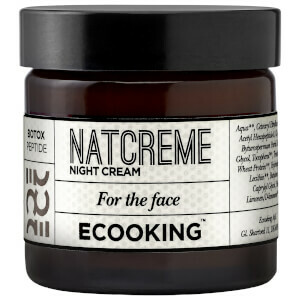 Address signs of ageing with Night Cream from Danish skincare brand, Ecooking. Rich yet lightweight, the quick-absorbing formula utilises Argireline; a hexapeptide that contains six natural amino acids, and works in the same way as Botox to help relax muscles naturally. Infused with peptides and collagen-enhancing ingredients, the face cream delivers long-lasting moisture and hydration, whilst minimising the appearance of fine lines and wrinkles to reveal a smoother, younger-looking complexion. Works around the clock to promote supple, plump skin come morning. Apply onto your face, neck and décolletage. Aqua**, Cetearyl Ethylhexanoate, Prunus Armeniaca Kernel Oil*, Cetearyl Alcohol, Acetyl Hexapeptide-8, Glyceryl Stearate, Stearic Acid, Sodium Lauroyl Glutamate, Byturospermum Parkii Butter*, Glycerin*, Carbomer, Phenoxyethanol, Caprylyl Glycol, Tocopherol**, Triethanolamine, Pseudoalteromonas Ferment Extract, Hydrolyzed Wheat Protein**, Hydrolyzed Soy Protein**, Tripeptide-10 Citrulline, Tripeptide-1, Lecithin**, Butylene Glycol, Xanthan Gum, Carbomer, Triethanolamine,Caprylyl Glycol, Phenoxyethanol, Citric Acid, Parfum**, Geraniol**, Limonen/D-limonene**, Linalool**.